The following article appeared in a local parish magazine in approximately 1947. Written by Reverend Gardner, it gives an insight into his time spent at The Vicarage. Reverend Gardner was vicar of St Mary’s Church from 1927 to 1942. This excerpt recalls crossing on the ferry to reach the island and the arrival of houseboats on the creek. This recollection reminds me of an experience belonging to my first winter in Benfleet. Walking down the hill from the Vicarage for Evensong – carrying a torch – I reached a point in the road from which – in daylight – a part of the town was visible below. In the November darkness one could see nothing – until I became aware of several tiny points of yellow light. As I watched them they moved slowly, apparently towards a common centre. Now and then one or other would disappear and then appear again in a slightly different position, nearer the centre. At first I was puzzled; then I realised that each one came from a storm lantern, carried by some one who was using it to see his way to Church. When I got to the porch I found half a dozen such lanterns stacked there, and others, still alight, were approaching. 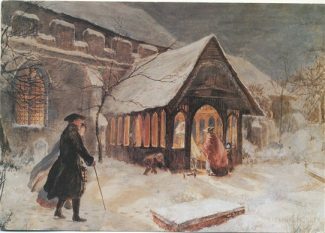 The watercolour of the 15th century church porch, painted by Frank Hobden, was presented to the Benfleet and District Historical Society by The Rev. Canon C J Gardner in 1991. It had been given to the donor’s father, The Rev. Ralph Gardner. That interests our eyes. And who goes there? Development at Canvey proceeded along similar lines, though the emphasis there was more on holiday bungalows. 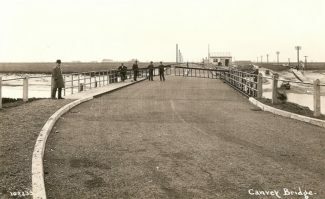 A serious objection to “living on Canvey” was the fact that no cars could get there or back for a large part of every day and walkers had to use the ferry. This latter was an ancient property, operated by the owner with a group of stalwart boatmen. I particularly remember one named Edwards, a huge, red-haired man who was used later by the daughter of Sir Charles Nicholson as her model for St Christopher in one of the painted panels of the rood-screen. The growth of custom for the ferry, particularly in the summer, tempted someone to start up in competition; but the old ferry owner’s resistance to this was upheld by a decision in the High Court. 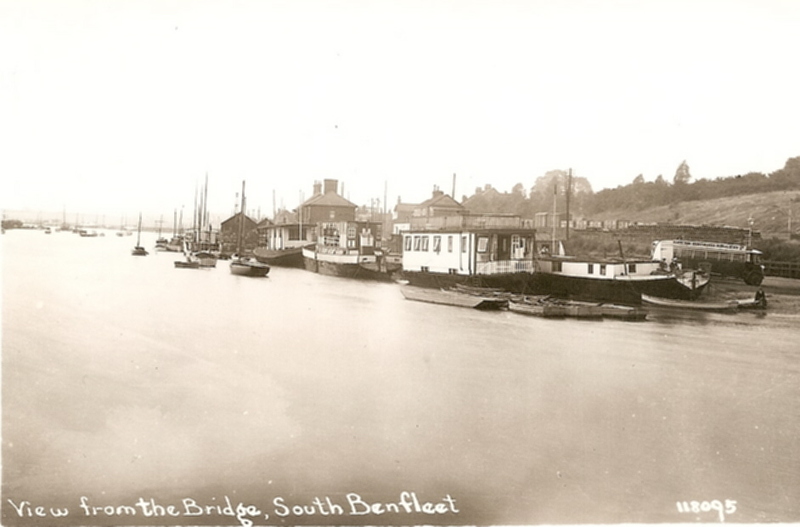 One of our favourite amusements in the early years of our life in Benfleet was to visit the Creek on Saturdays in summer when the water was rising to watch cars “taking a chance” – until sometimes- one got stuck in the middle and had to be manhandled to the other side. On one occasion some night visitors to Canvey left their car, as they thought, safely on dry land late at night; and returned next morning to find all but the roof under water. About 1929, after 18 months work, the ferry – bought out with substantial compensation – was displaced by a swing-bridge. After that Canvey development kept pace with that of Benfleet, and has now, I believe, surpassed it. In my day there were several families in Benfleet who were descended from the Dutch labourers who worked on the sea-wall two centuries ago. The names Jiggens (?Jurgen) and Jermyn (? German) would seem to identify them. Another feature of Benfleet “development” was the arrival of a “household population”, which had become considerable by 1927. People bought old hulks and barges and lesser craft, managed to pole or sail them in to the Creek, tied them to the shore, and built more or less fantastic superstructures on them to live in. Some of these houseboats were solidly and even tastefully finished. …many of them were ramshackle affairs, of which the best that could be said was that they did not capsize when the tide lifted them off the mud every twelve hours. I recall a young architect, newly married, who himself poled his barge, with a friends assistance, from Gravesend, and converted it into a quite delightful dwelling. But many of them were ramshackle affairs, of which the best that could be said was that they did not capsize when the tide lifted them off the mud every twelve hours. By 1927 there must have been well over a hundred houseboats moored in the Creek, and for some time their numbers were increasing. They presented the local authority with difficult problems; not least that of sanitation. Attempts to control them, to reduce their numbers and even to assess them for rates, were largely ineffective. Eventually legal processes resulted in the moorings being assessed for rates. I believe an order was once obtained requiring that all houseboats should be capable of being navigated. As the great majority would certainly have sunk or capsized if they had been loosed from the shore, nothing happened. In my time some interesting people lived on houseboats. One was a retired regular army officer, who had lost a leg in the war, and, with the aid of a succession of housekeepers, kept his boat spotlessly clean and bright. Another was the son of a well-known novelist, who used to go about in thigh-boots with several days growth of dark beard on his rather handsome face, spoke with an “Oxford” accent, and spent much time making model galleons. The pictures on this page did not form part of the original article. 1994 and all that ! Evening Concert for St. Dunstan's. Vikings come to Benfleet 1994?